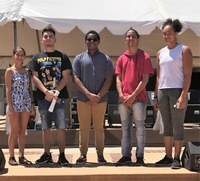 Information about the Mayor's Youth Advisory Council. 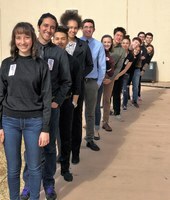 The Mayor’s Youth Advisory Council works to provide the Mayor’s office with the youth perspective on city issues and to foster a sense of community in order to aid in the development and betterment of Albuquerque. 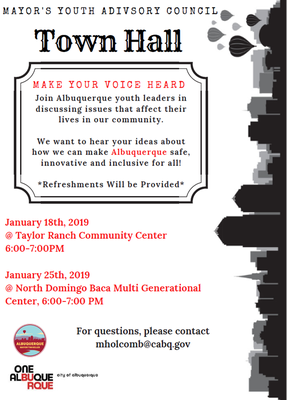 The Mayor's Youth Advisory Council (MYAC) works to provide input and advise the Mayor on issues important to Albuquerque's youth. To do this effectively, each year the council completes a project pertaining to a specific topic they feel is affecting their peers, such as teen pregnancy, vaping, ect. MYAC is composed of up to 21 members representing communities from across the City bringing the voice of our youth who are currently of high school age (freshman-senior). Meetings are held the first Thursday each month from 5:30 to 6:30 p.m. in the Mayor’s Office at 1 Civic Plaza, 11th floor.